In September Lynn Rempel, CEO of Rempel Insurance Brokers, and daughter Leanne Rempel attended the IBAC Annual Meeting in Nanaimo, BC. 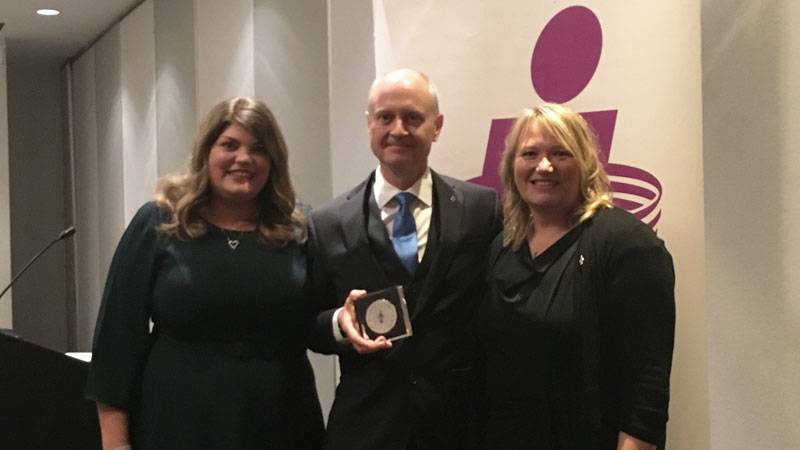 They were pleased to congratulate Greg Mansfield, Education Manager at IBABC (Insurance Brokers Association of British Columbia), as the 2017 Dale Rempel Award of Excellence recipient. Greg said the award holds very special meaning because he knew Dale and volunteered with him. Greg has developed a lengthy resume in his professional insurance journey. He started working on the insurance company side, later becoming a broker, and eventually working his way into his current responsibility coordinating education and training for insurance brokers. He holds a Bachelor of Arts in Economics, a Canadian Accredited Insurance Broker certificate (CAIB), a certificate in Adult Education, as well as a certificate in online instruction. Greg is a very deserving recipient who exemplifies the attributes IBAC recognized in Dale Rempel; belief in continuing education and desire to give back to an industry that meant so much to him.